The Future Investment Initiative has come under scrutiny amid reports the critic of the Saudi royal family was killed inside the Saudi consulate. Several journalists and media organizations have pulled out of a high-profile conference in Saudi Arabia following the disappearance of Jamal Khashoggi, the Saudi journalist who has been missing since Oct. 2. The U.S. media's involvement in the annual Future Investment Initiative has come under scrutiny amid reports that Khashoggi, a one-time Saudi royal family insider turned critic, was killed inside the Saudi consulate in Istanbul by a squad of Saudi Arabian officials. "I’m terribly distressed by the disappearance of journalist Jamal Khashoggi and reports of his murder," Andrew Ross Sorkin, the New York Times columnist and CNBC anchor, tweeted Thursday morning. "I will no longer be participating in the Future Investment Initiative in Riyadh." Patrick Soon-Shiong, the publisher of The Los Angeles Times, has also decided to skip the event, while the New York Times says it will no longer serve as a media sponsor. Others have yet to confirm their plans for the event: A Fox Business spokesperson told NBC News that the matter was "under review" by the network and its anchor Maria Bartiromo, who is slated to appear. On Friday, CNN released a statement on Twitter, saying it has withdrawn its participation in the conference. It was followed by a tweet from the Financial Times confirming it will not be partnering with the conference "while the disappearance of Khashoggi remains unexplained." Bloomberg's deputy editor-in-chief, Reto Gregori, announced Friday morning via Twitter that the company would no longer be a media parter for the event. 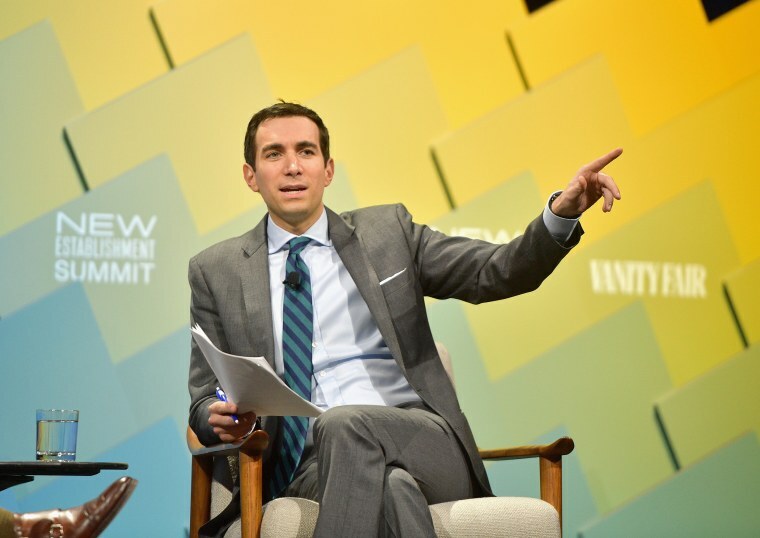 Justin Smith, the CEO of Bloomberg Media Group, had been scheduled to attend, as were Bloomberg anchors Francine Lacqua and Erik Schatzker. CNBC announced on Friday morning that it would "no long participate in the FII in Riyadh due to the continuing questions surrounding the disappearance of journalist Jamal Khashoggi." Zanny Minton Beddoes, editor of The Economist, announced she would no longer participate. The Future Investment Initiative, which is now in its second year, brings together notable business leaders, investors, celebrities and members of the media. It is financed by the Saudi royal family and scheduled to take place Oct. 23-25 in Riyadh. In addition to the media personalities, this year's listed speakers include Softbank CEO Masayoshi Son, JPMorgan Chase CEO Jamie Dimon, Colony Capital Executive Chairman Thomas Barrack and Liontree CEO Aryeh Bourkoff. Steve Case, the AOL co-founder who now serves as chairman of venture capital firm Revolution, also announced he was pulling out. “In light of recent events, I have decided to put my plans on hold, pending further information regarding Jamal Khashoggi,” he tweeted. Richard Branson, the founder of Virgin Group, was not scheduled to attend the summit but announced Thursday that he would suspend his directorships of two tourism projects backed by Saudi Crown Prince Mohammed bin Salman. "What has reportedly happened in Turkey around the disappearance of journalist Jamal Khashoggi, if proved true, would clearly change the ability of any of us in the West to do business with the Saudi Government," Branson said in a statement. "We have asked for more information from the authorities in Saudi and to clarify their position in relation to Mr. Khashoggi." Viacom CEO Bob Bakish and Uber CEO Dara Khosrowshahi also canceled their participation. The concerns also began to spread to Silicon Valley, where Saudis have invested billions in U.S. tech firms. "I am suspending my involvement with the NEOM advisory board until the facts regarding Jamal Khashoggi’s disappearance are known," Altman said in a statement, speaking in his personal capacity. "This is well out of my area of expertise, so I don’t plan to comment on the case until the investigation is finished. I remain a huge believer in the importance of building smart cities." Ernest Moniz, who was energy secretary under President Barack Obama, also has suspended his involvement advising the project. On Thursday afternoon, Turkey said it had agreed to a request by Saudi Arabia to form a joint committee to investigate Khashoggi's disappearance. Claire Atkinson and David Ingram contributed.